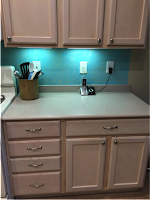 We decided to take on a DIY project by installing our own kitchen cabinet hardware, doorknobs and drawer pulls. Despite some minor setbacks we finished in a few hours and then completed the master and hall bathrooms. We picked out the hardware color for the kitchen based on our pantry doorknob, which is brushed nickel. This way the whole house has the same color scheme. The cost for all the hardware for the kitchen and two bathrooms was under $90 and the cleaning solution was made with items I already had. 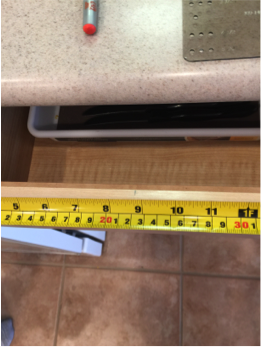 The kitchen has 22 doors and 10 drawers. The master bath has four doors and eight drawers and the hall bath has only two doors. 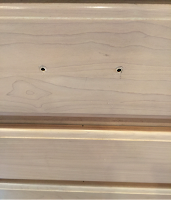 The knobs were much easier to install as it only took one hole. 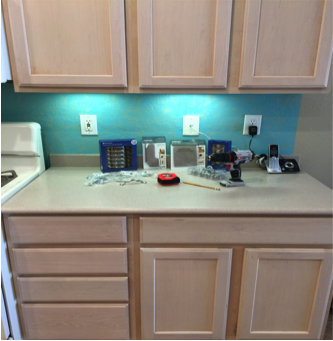 We purchased everything at Lowe’s Home Improvement and bought some handles and knobs in bulk boxes of 10 or 12 and then singles for the extras needed. You save money if there are 18 knobs needed, it is more cost effective to buy one box of 12 and 6 additional, otherwise you are paying for knobs you don’t need. 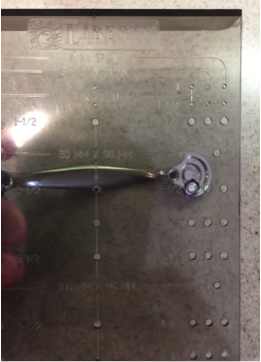 We also purchased drawer handle and door knob templates. The only thing missing from this first picture is the vacuum cleaner!! There will be a lot of wood shavings in and around everything! 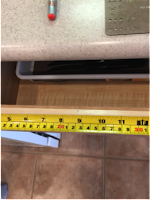 Step by Step Instructions: Including Photos! 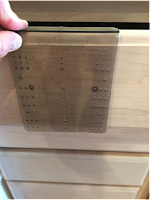 Measure the center of the top of the drawer, then chose the holes on the template to fit the handle. 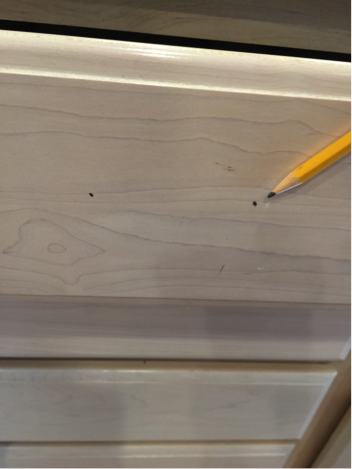 Place the template over the center mark on the top of the drawer and pencil in the holes where you want the handle to be placed. 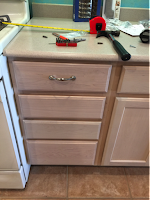 We chose to center all of the handles based on the size of the drawers. 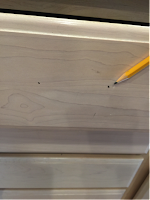 Time to drill… we drilled a pilot hole and then the 3/16th size needed. Time to put the screws in and attach the handles! The first section of finished hardware! No more grabbing sides and tops of drawers to get them open! 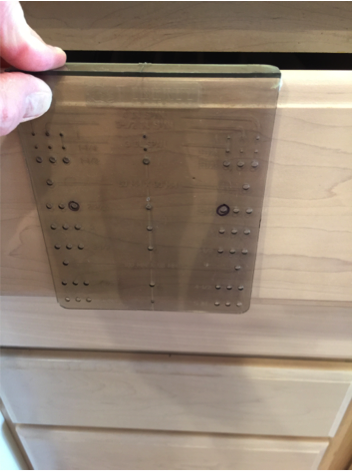 The only problem we had was the box of handles came with two different sizes of screws and the individual packages came with only one size screws that did not work. 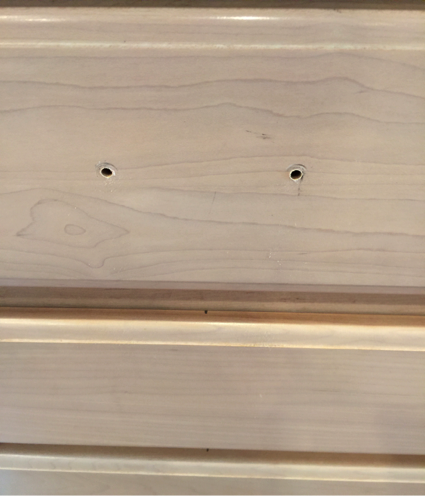 We had to make an additional trip to Lowe’s to buy the correct size screws. 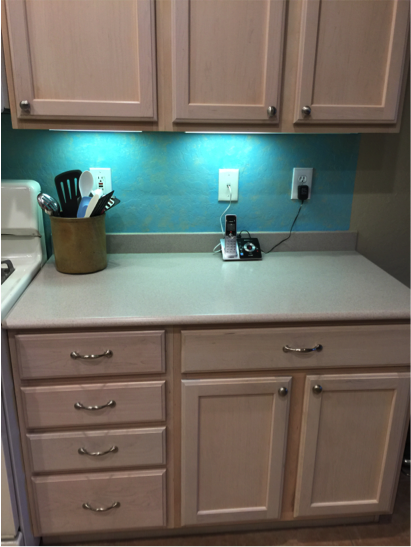 Prior to starting this project I cleaned all the front of the cabinets with a homemade cleaning solution that also saved me money! Place all in a plastic spray bottle and shake often as you are cleaning. Lemon or other scented oils can probably be added for fragrance. 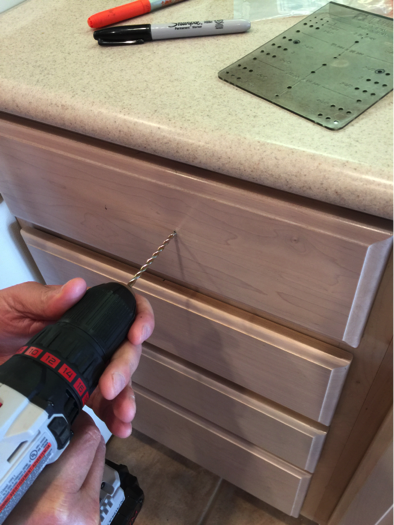 Drawers had to be mostly empty for drilling, etc. so I took the time to purge, vacuum and clean out each drawer. We also purchased new bumpers for the doors/drawers to replace missing or old ones. Have fun!